Christmas Eve is the evening before Christmas Day, the widely celebrated annual holiday. It occurs on December 24 in Western Christianity and the secular world, and is considered one of the most culturally significant celebrations in Christendom and Western society, where it is widely observed, by Christians and by many others, as a full or partial holiday in anticipation of Christmas Day. Christmas celebrations have long begun on the night of the 24, due in part to the Christian liturgical day starting at sunset, a practice inherited from Jewish tradition and based on the story of Creation in the Book of Genesis: "And there was evening, and there was morning – the first day." Many churches still ring their church bells and hold prayers in the evening; for example, the Nordic Lutheran churches. Since tradition holds that Jesus was born at night (based in Luke 2:6-8), Midnight Mass is celebrated on Christmas Eve, traditionally at midnight, in commemoration of his birth. The idea of Jesus being born at night is reflected in the fact that Christmas Eve is referred to as Heilige Nacht (Holy Night) in German, Nochebuena (the Good Night) in Spanish and similarly in other expressions of Christmas spirituality, such as the song "Silent Night, Holy Night". 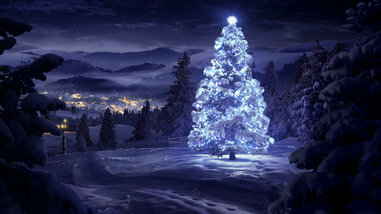 Many other varying cultural traditions and experiences are also associated with Christmas Eve around the world, including the gathering of family and friends, the singing of Christmas carols, the illumination and enjoyment of Christmas lights, trees, and other decorations, the wrapping and/or opening of gifts, and general preparation for Christmas Day. Legendary Christmas gift-bearing figures including Santa Claus, Father Christmas, Christkind, and Saint Nicholas are also often said to depart for their annual journey to deliver presents to children around the world on Christmas Eve, although until the Protestant introduction of Christkind in 16th-century Europe, such figures were said to instead deliver presents on the eve of Saint Nicholas' feast day (December 6).